Cortney McDaniel and Charlotte in action. Eventing is a sport dominated by thoroughbred and warmbloods, so spectators are likely to do a double take when they see a clydesdale on the course. Clydesdale mare Charlotte is being aimed for the Rebecca Farm novice three-day-event by owner/rider Cortney McDaniel in Washington state. The mare’s path to compete in the long-format three-day-event in Montana later this year has captured the interest of the sport’s fans, and her owner is documenting the journey. McDaniel bought Charlotte five years ago to be a vaulting horse – but she jumped out of her pasture every day, “which I believed was a sign we should try jumping,” said McDaniel, who had never jumped before owning Charlotte. Charlotte’s registered name is HBR’s NW Commander’s Caden, and she’s 10 years old. She graduated to novice level at her very first start of the season, late last month. 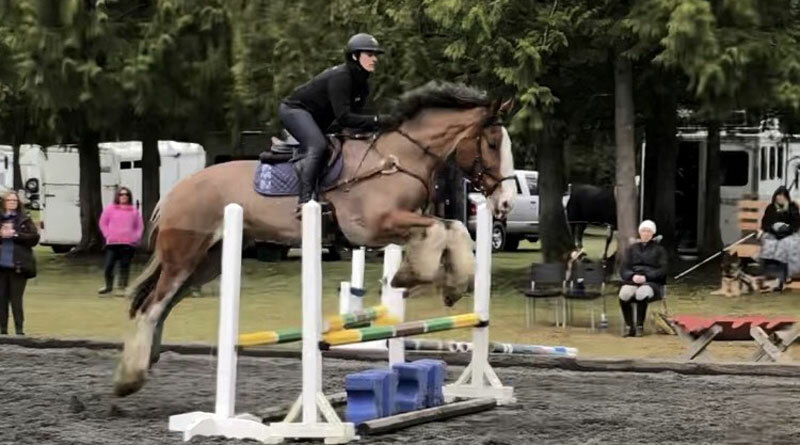 The pair have been working under the instruction of trainer Jenny Holbrook, in Monroe, Washington, and recently took part in a clinic with Canadian Olympic eventer Hawley Bennett. McDaniel, 28, juggles her riding with full-time work as a 911 dispatcher, working Monday to Thursday each week, from 1am to 11am, in order to have weekends free to compete. She describes her riding as “therapy sessions”. » Follow Charlotte’s progress on the blog Eventing Clydesdale. Cortney McDaniel and Charlotte at a clinic with Hawley Bennett. I love this article! Thank you for sharing our adventure!